What follows are the WoLF easy setup procedures, installation tips, system adjustments, safety tips and precautions. Upon taking the WoLF out of its box, be sure to place it on a stable surface. Don’t use tables that can tip over! The Combining Tube is held securely in place so as not to allow any strain placed upon glass components above. Remove the WoLF output fitting from the back of the machine and place in front as shown in picture. Find the 2 wires and small tube stuffed back in the bottom of the WoLF and pull them out slightly where you can see them. In order to slide the output right angle fitting onto the mating WoLF fitting, the WoLF needs to be pulled to the edge of the counter because the fitting sticks farther down. The output fitting assembly slides over the mating WoLF fitting with the black ‘O’ rings. Gently push straight back. The connection is firm and tight but should not require any forcing. A gentle rocking or slight twisting back and forth motion might assist the mating. Be sure the fitting assembly is pushed fully in. Make sure the output fitting points straight downward and is not twisted off to a side. Now connect the wires to their respective connectors and the small tube to the small brass fitting. Order your WoLF with either left or right side input and waste water drain tubes. The picture shows the left side input. The main input brass fitting is the female end for the common 1/2″ garden hose. 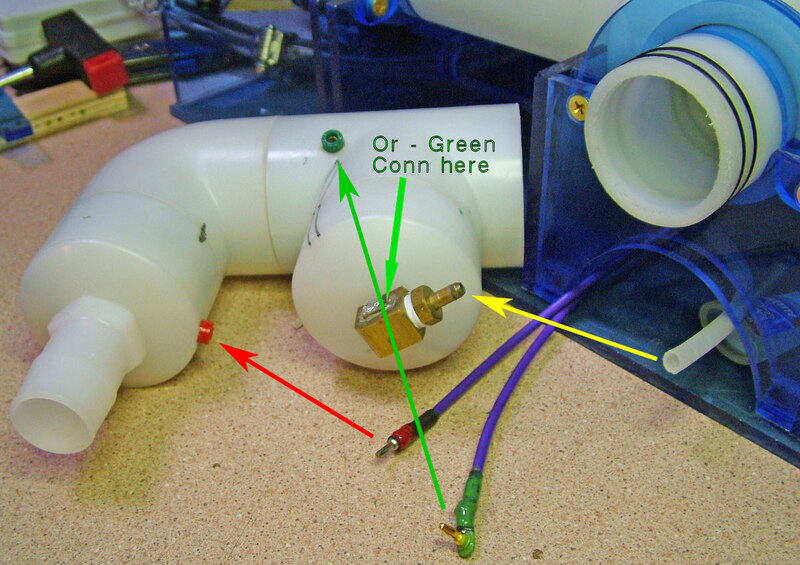 We or your plumber can put on whatever connector you need for your install. GRAVITY FEED SYSTEM – This means that all hoses leaving the system MUST have a fully unobstructed downward flow with no air pressure locks. (If a hose goes down and then back up for a bit, it will retain a pool of water in the valley that will require a certain amount of pressure for the rest of the water to overcome.) This can not be allowed. As an example, were you to lift the output hose higher than the output fitting assembly of the WoLF, you would cause water to flow backward into the WoLF and overflow it. This must be avoided at all costs. You could damage the electronics if you do. You will need to provide a convienant way to control water flow (turn it on/off) to the input of the WoLF and it must provide at least 14lbs of pressure. The WoLF input pressure regulator is factory adjusted to 18lbs of pressure for optimal operation. When you turn the water source OFF to the WoLF with full vortexes, it takes roughly 45 seconds for the vortices to empty out about 1 gallon that remains in the system. So the WoLF operates best when there is a receiving tank in the system design and then you can fill your water containers from the tank with complete control. You could run a gravity feed output hose into the sink basin and fill glasses and pots from there but you would waste lots of water doing it that way. Even with a tank and an on/off water input control, you still have to remember to shut the water flow off to the WoLF so you don’t overflow the tank. Most people choose this method to fill a tank but It does require you to be mindful. 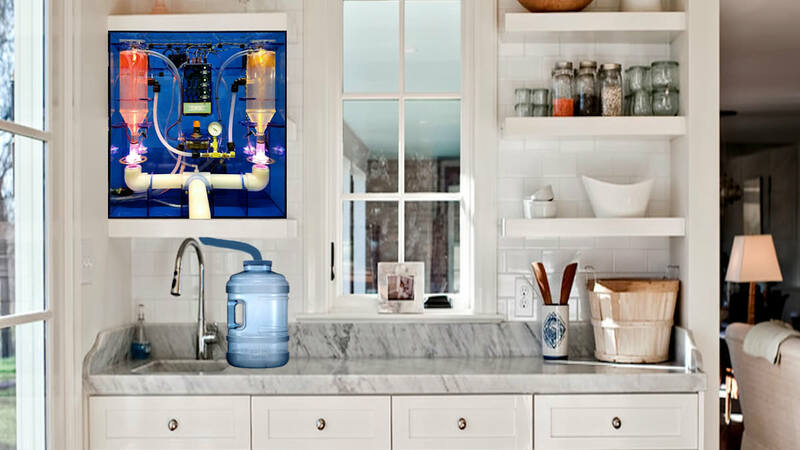 Like a whole home system install, a fully automated kitchen countertop design is possible but will require a supply pump, tank level sensors, a tank, on/off solenoid and an electrical circuit. And then, the WoLF would turn on/off based on tank water level. There are so many installation options, we usually leave it up to the customer to fulfill that part of the system design. But we are hear to answer questions and help you or the plumber with the install. NOTE – As much as possible, avoid touching or messing with the WoLf while it’s running and turn off the control box switches before the water leaves the vortex completely. Have all inputs and outputs in place and ready to go. Ready the receiving tank and be sure that an unobstructed Gravity Feed water flow is properly setup. Turn on the water supply to the WoLF. Begin filling the vortexes. 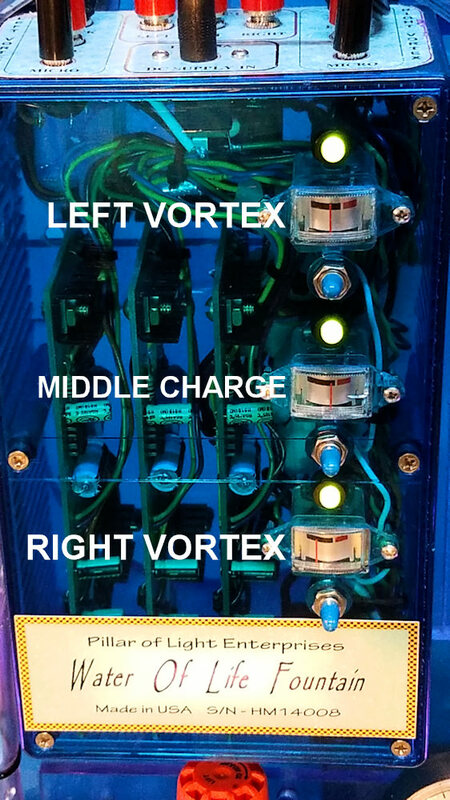 Once water is flowing through the vortex charge screen, turn on all 3 control box switches. Avoid touching the WoLF while it’s running so your biofield does not interfere. Be sure vortexes fill to the proper level. Make small adjustments if necessary. Partially fill the receptacle tank leaving room for another gallon. Shut off the water supply to the WoLF. The full vortexes will continue to empty out about another gallon. Before the water runs empty through the vortex charge screens, shut down all 3 control box switches. The remaining water will run out of the combining tube of the WoLF and the process is done. requires the WoLF to be positioned on the edge of the counter so that the right angle output assembly fitting and its hose can stick straight down and clear the edge of the counter. the receiving storage tank must be low – either to the side of the counter, beside it or under it to allow for gravity feed. Easiest setup but not the most user friendly as all your water transactions will be lower than the counter top. With a custom stand to support the WoLF up off the counter top, you may be able to put a small receptical tank directly below. 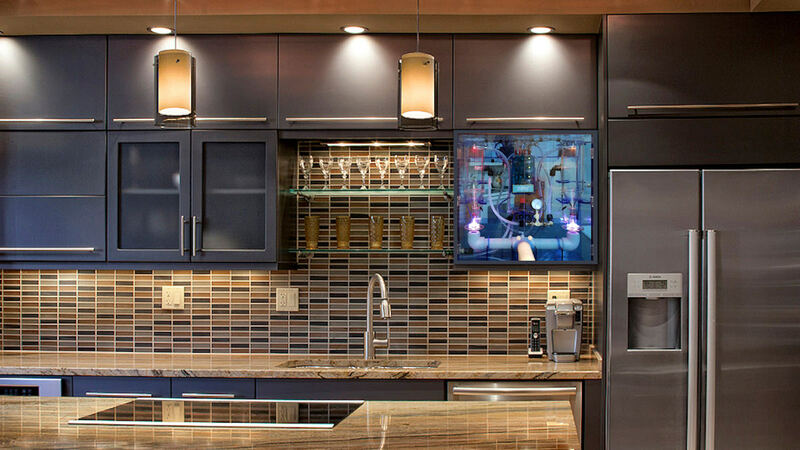 The tank could be on top of the counter or built in to your liking. The excess water hoses could then easily be routed to the sink basin or more permanently tucked away from view under the sink with the proper plumbing. 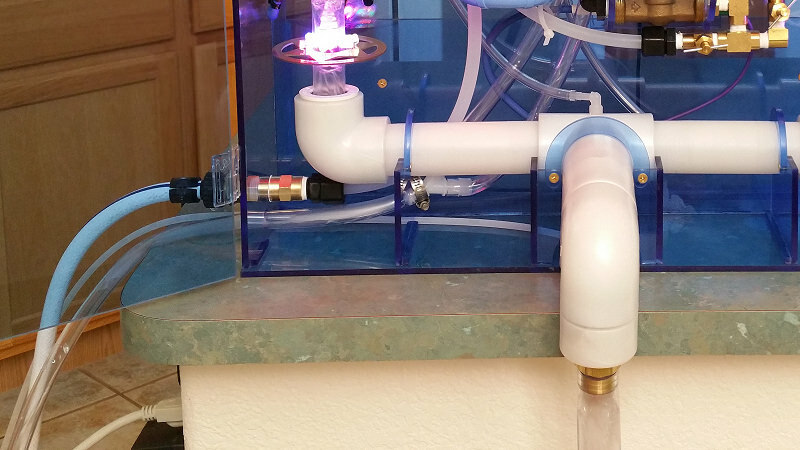 The custom stand could also be designed to hide all input and output hoses from view. 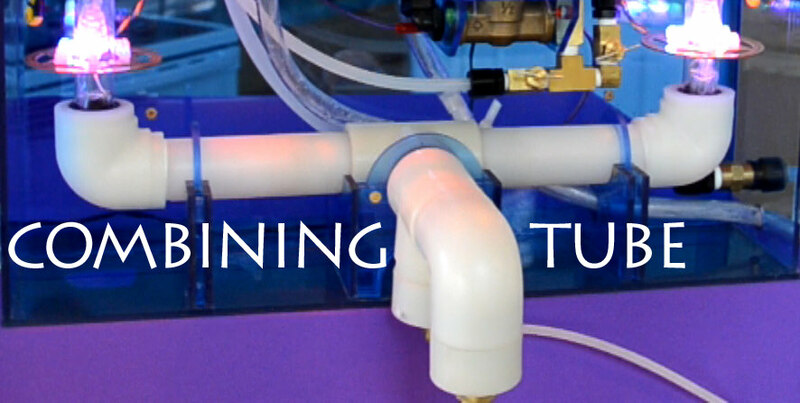 This method would make water transactions easier with less bending down. This installation would provide the best looking install and even more ease of use. Gravity Feed action is optimized. Bigger space between bottom of WoLF and counter top means you could have a larger holding tank installed. May require high enough kitchen ceiling. If you choose this method, keep in mind that the WoLF has a Top Lid which opens upward for service. Think about where you will run all hoses and power cord. The WoLF easy setup and initial system adjustments are few and relatively stable from them on, requiring only minor and rare refinement. So long as your input water pressure does not vary wildly, water input adjustments to the whole system and then the Left and Right Vortexes remain farily stable as well. Adjustments are not super critical. MAIN RED KNOB VALVE – Once the WoLF is in place and all input and output tubes are connected, you can turn on the input control source valve thay you installed or use to control flow to the WoLF and begin letting the vortexes fill up with water. The WoLF comes preadjusted. The RED Main Input Knob controls overall WoLF system pressure. It should be adjusted to aproximately 18lbs. To adjust the RED Knob, pull straight up on the Red Knob, and turn Clockwise for more pressure and Counter Clockwise for less pressure. 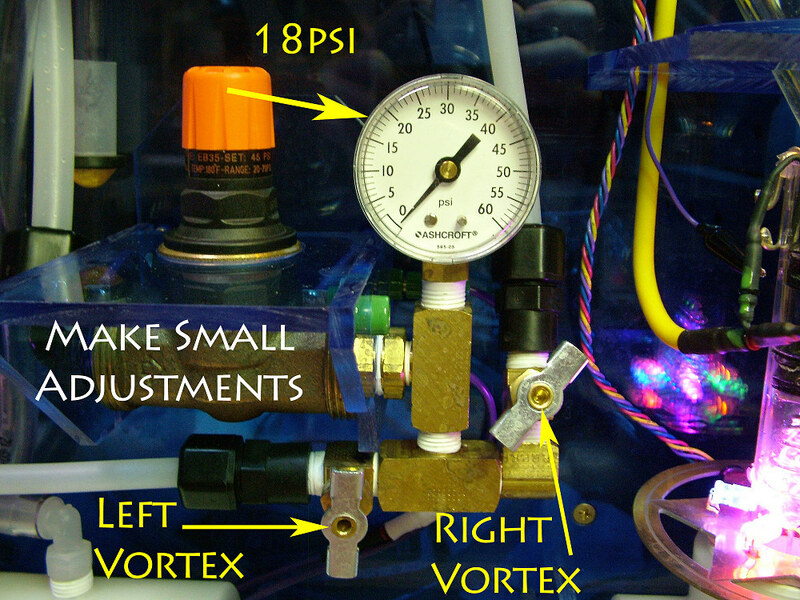 Set This Main Pressure Adjustment FIRST and BEFORE Messing With The Individual Vortex Settings! Once it is set, push the Red Knob back down. That’s it. LEFT and RIGHT VORTEX Pressure Adjustments – These 2 Thumb knob Needle Valve adjustments come factory preset also. Use very small adjustments until you become accustom to how they work. A Clockwise turn reduces the water flow to its vortex. It slows down the “fill up” rate. A Counter Clockwise turn increases the water flow to its vortex. It speeds up the “fill up” rate. Proper Vortex Level Setting – (See the Vortex Overflow Outlet Pipe photo) – The water should not rise too fast in the vortex as it is filling. An average time required to fill a vortex to its full level is around 1 minute. 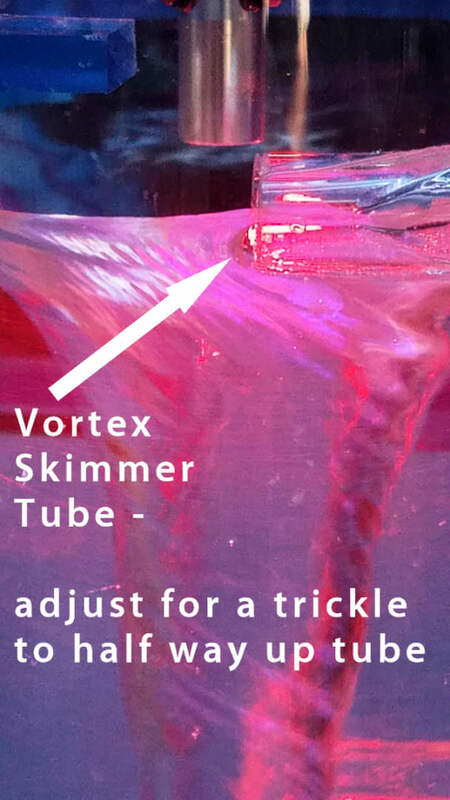 As the water level approaches the Vortex OverFlow Outlet Pipe, see that the water fills no more than half of the tube. Anywhere from a small trickle of water going out and down the outlet tube to 1/2 full where it meets the vortex is fine. This is waste water that goes out the waste water tube into your plumbing system; whether it be directly into sink basin or into the plumbing itself or to the outside through a hole in the wall. (You can water outdoor plants with it.) 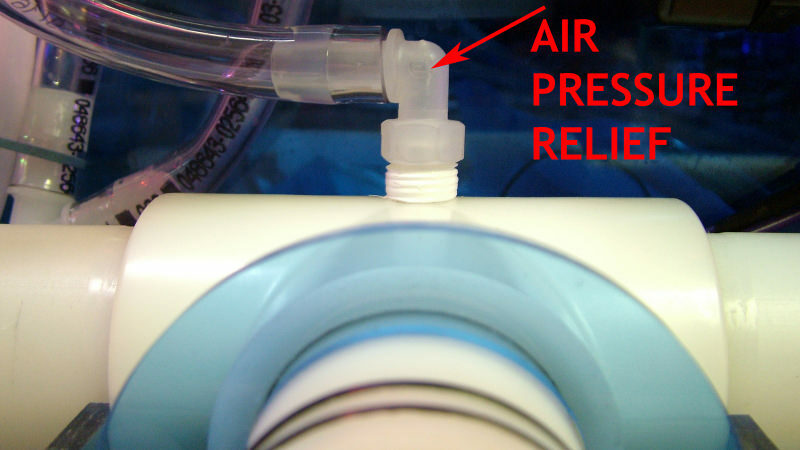 Not only does the overflow outlet tube serve the mechanical function of water level but it also removes the top layers of concentrated and oxygenated water which attracts living organisms; such as the rare bacteria or virus that might make it through any of your filtration system Those things get skimmed off at the top to further reduce their occurrance. DO NOT LET THE VORTEX TUBES OVERFLOW! – If for any reason, you see this about to happen, 1st THING – immediatetly shut off the 3 switches on the electronics control box of the WoLF. Next, turn off your main input valve going to the WoLF. And finally, adjust the 2 WoLF vortex flow rate valves accordingly. You NEVER want to let the vortex overflow and get electronics wet. See More Operational Safety Warnings Below on what can cause the WoLF water system to overflow. This is another WoLF easy setup procedure for controlling the Current Load of Each AMT Coil. While the adjustment is made with the Coil Switch, its effects are read on the Electronic Control Box Front Panel Current Meter. The switch provides 3 output strength choices; Low, Medium and High. First, turn OFF all 3 Control Box Switches. Then, change the desired coil switch setting. Finally, turn back ON all 3 Control Box Switches. The switches control a high volts but very low power signal. The high volts is upwards of 90,000 volts pulsed Direct Current and making switch adjustments while it’s ON can create spikes or surges with this unusual energy. Such spikes can play havoc on the elctronics. In order to be gentle on your WoLF’s electronic system, ALWAYS turn all 3 electronics Control Box switches OFF FIRST – before making any further coil switch changes. Then turn them back on afterwards. Water conductivity varies with the amount of minerals and particulate matter prersent in the water. If the water is very pure with low mineral content, the water conductivity will also be low. If the water has lots of minerals present, the water will be more conductive. The AMT Coil switches give you some adjustment room to account for your specific water supply attributes. Each coil switch can have its own setting. All 3 coils do not have to be set the same. There is no concern about high precision in the current load meter for each coil ouput. Rather, the meter is there to give a general idea about how conductive your water might be and the current load it places on the electronics. The only time you really need to be concerned with changing the coil output setting switch is when the meter reading for that coil is either very high or very low. Normally, anywhere in the middle will do just fine. Even if the Meter Needle is in to the red somwhat. That’s not a problem. Pegged or almost pegged to the right or left is a problem. Change the switch setting. If the Meter reads too high, move the related coil switch to a lower setting. If the Meter reads too low, move the related coil switch to a higher setting. Once set, the Meter readings are not likely to vary much unless the input water conductivity changes drastically. Here are some points to inspect In the initial WoLF easy setup and during occassional maintenance routines. 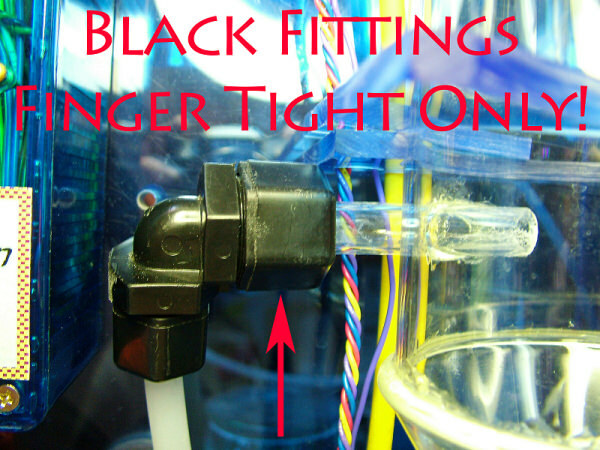 All black fittings as seen in photo are designed for FINGER TIGHTENING ONLY! Should a fitting begin leaking, use only the strength of your fingers. Too much tightening risks breaking the glass tube. Be extremely careful! When tightening the black fittings, be extra careful that no pressures are placed upon the glass tubes that could snap it off. Example – Tightening but also accidently applying a downward force on the tube to break it. GRAVITY FEED SYSTEM – Make sure to never cause a backup of water in the WoLF that could cause and overflow and damage electronics. Observe all precautions with unobstructed output flow. The output charge screen and Heavy Metal Trap should be inspected on ocassion for corrosion or sediment buildup. 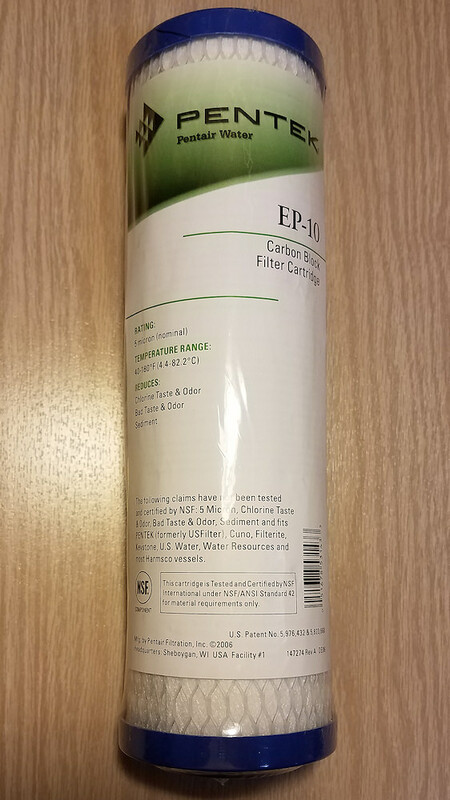 The FILTER Cartridge should be replaced in accordance with its manufacturing specifications – but even in low use, cartridge should be replaced once/year. Here are some safety tips for you and your WoLF easy setup and its everyday usage. These safety tips are not only for your personage but for the safety and continued proper operation of your new Water of Life Fountain. As demonstrated in this video, the WoLF energizes the water with 3 distinct frequencies that are of high voltage; roughly ranging from 40,000 to 90,000 pulsed Direct Current (DC) carrier waveforms. In the video, the hand held device makes the normally silent frequencies audible. Even though the power and current in these waves is extremely low, the high voltage is somewhat precarious to manage within a conductive water system. While these energies are awesome for structuring the water, they must be carefully managed to protect the electronic circuitry that develops them. 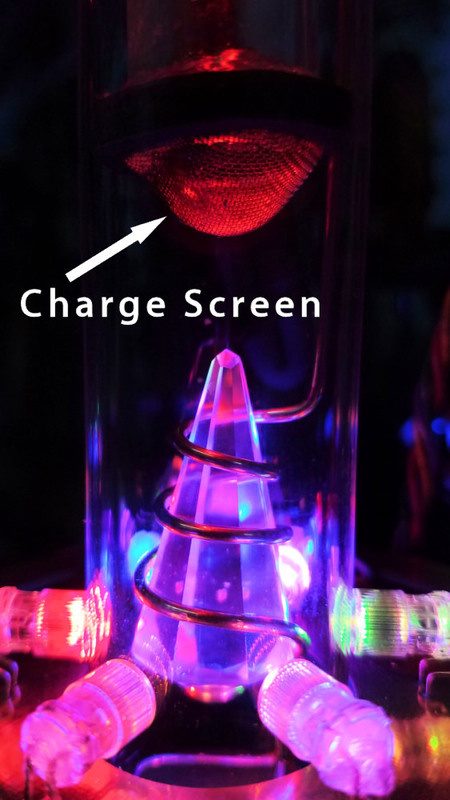 The high voltage energy is developed by our proprietary AMT or Advanced Modified Tesla Coil. This energy is no ordinary electromagnetic field and has unusal properties that love to backup into the electronics and complicate things. So there are precautions that we take in curcuitry design and with procedural usage of the WoLF. Also, because any water that will run through the WoLF is going to be quite conductive, the 3 distinct frequency outputs are going to mix together. 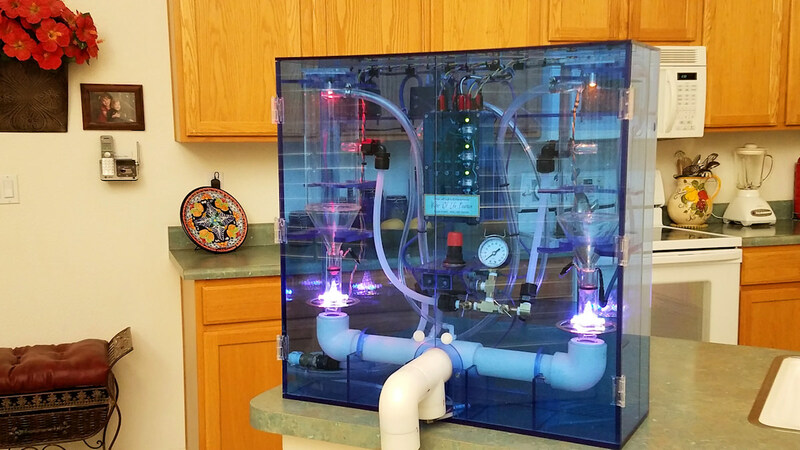 Each coil output is injected into the system in its own location but then they are all electrically connected by the water itself. 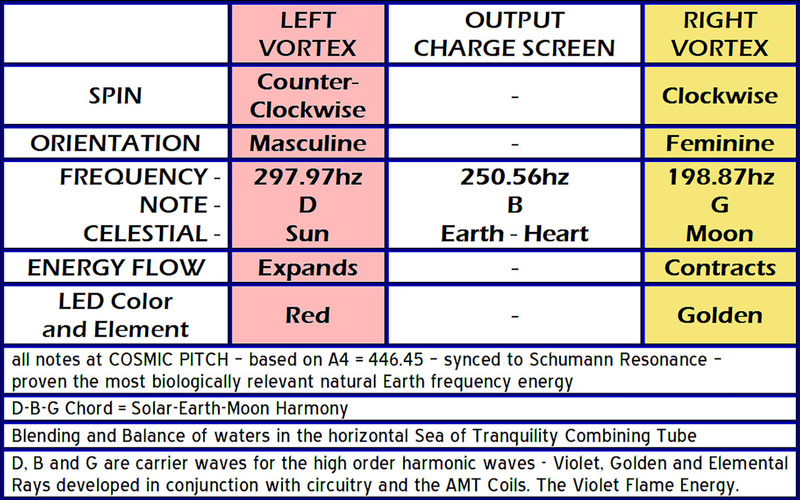 As frequencies add up, new harmonic frequencies are created that can complicate things even more. Many little details go into harnessing and managing the fields developed within the WoLF system. In total, there are over 300 agents or vectors of energy and information that go into the holistic processes that change the properties of the structured water. And all of them are interacting as a unified whole, just like nature does. 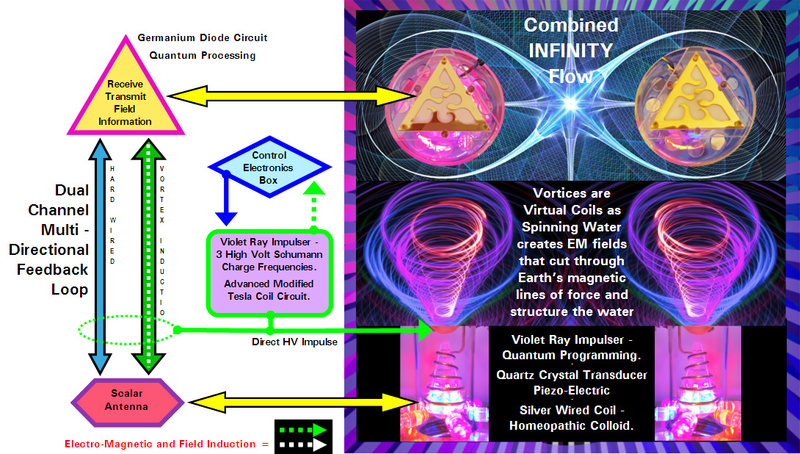 The system can be so senstive to surrounding electromagnetic – EM fields, that just the EM field of your body standing in front of the WoLF will interact with its fields and the water as it’s being structured. So even when you are not directly connected to the WoLF system, your field is still interacting with it. Because of this extreme level of sensitivity, some special yet easy to follow precautions are required to ensure continued and proper operation of your WoLF quantum water structuring machine for many years to come. Never touch any part of the WoLF electrical system or water system while it’s running. This includes all wires and their connectors, LED Earth Star Assembly, AMT Coil Assemblies, Triad Vortex Assemblies, etc. You MAY touch the Water Pressure Adjust Knobs in order to make necessary adjustments to vortex filling behavior. 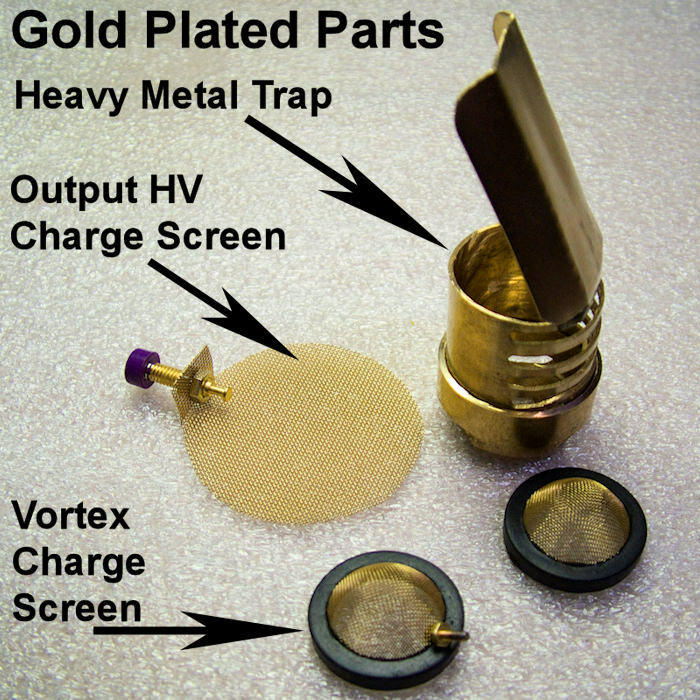 HOWEVER – The brass needle valve parts can also be electrostatically charged. So while you are touching those to make adjustments, don’t touch anything else conductive with another part of your body such as your free hand. If you do, you may receive a slight shock but otherwise not harmful. Never touch any part of the WoLF electrical system or water system while it’s running. This includes all wires and their connectors, LED Earth Star Assembly, AMT Coil Assemblies, Triad Vortex Assemblies, etc. Your body field can react with the EM fields of the WoLF that can cause spikes or EM surges and field fluctuations that put stress on electrical components. The LED Earth Star is particularly vulnerable to spurious EM spikes and surges! Such energies can blow out the LED’s. (Light Emitting Diodes) Keep your hands away from them while WoLF is structuring water. Don’t even point objects such as pens or fingers at them while running. It may seem like overkill (and it is) but better safe than sorry. The more you fiddle with the WoLF when it’s running, the more risk you run of creating field fluctuations. Just leave it alone and it will be fine. THE WOLF MUST BE OFF WHEN MAKING ANY ADJUSTMENTS, CONNECTIONS OR DISCONNECTIONS OF ANY KIND! NEVER do any of those things while the WoLF is running. 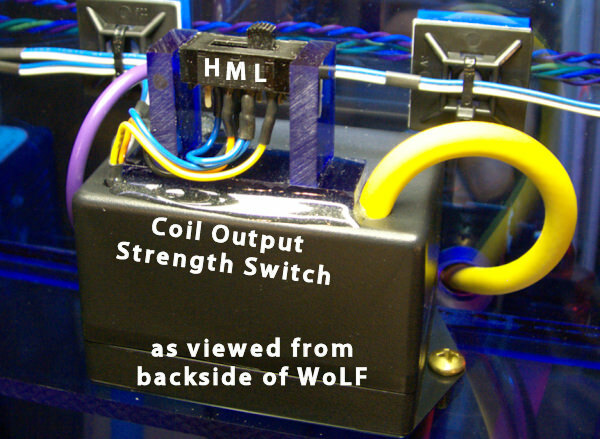 Never make AMT Coil Output Strength Adjustments with the 3 position switch while the WoLF is running. Shut the WoLF off first. 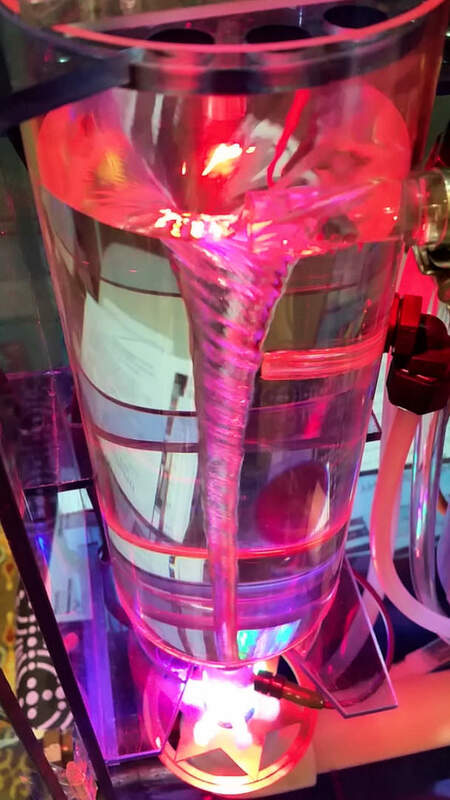 NEVER allow the WoLF water Vortex Tube assemblies to backup and overflow. 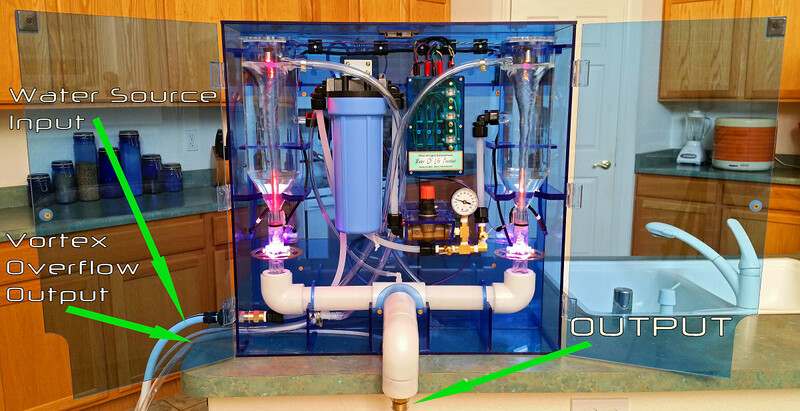 Water would come out of the open tube just above the Violet Ray Impulser and the LED Earth Star and get them wet. This would place HIGH VOLT electrostatically charged water in contact with senstive electronics of the system and may cause damage.